Written by Rosemarie Parent using the Arrow Lakes Historical Society’s book Circle of Silver and their extensive archives. Mines were already being staked in the Lardeau area when in 1890 Andrew Abrahamson arrived at the head of beautiful Trout Lake, which he registered and called Trout Lake City. Upon this land he built a log house that was a welcome shelter for hundreds of miners and prospectors who later came in search of gold. Charlie Holten and Thomas Downs joined with Pete Walker and Lockheed McDonald to cut a trail from the north arm of the Arrow Lakes to Trout Lake in 1891. With good luck and perseverance, they found the Great Northern lead and staked four claims. The promise of good returns from the group of mines including the very productive Silver Cup so impressed the government that in 1892 a proper trail was built using Holten’s survey lines. This easier access to the region brought out scores of prospectors. A proposal by Abrahamson to place lots for sale at Trout Lake City was advertised in the Kootenay Star in 1893. Another ad appeared in the Kootenay Mail in March 1894 with the price of corner lots going for $150 and inside lots at $100. 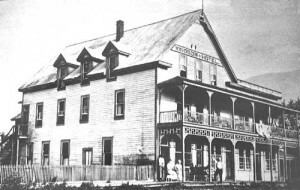 Alice Jowett came to Trout Lake City in 1896 and because she was looking for a means to support her family of three children, Evelyn, Edith and John, she decided to purchase the Trout Lake City Hotel, which was a two-storey part-log building built about 1894 by John Bourke. Alice had a thorough education in cooking, pastry and confectionery foods from which she could make a good living and also indulge in her dream of prospecting. The miners flocked to her little establishment. 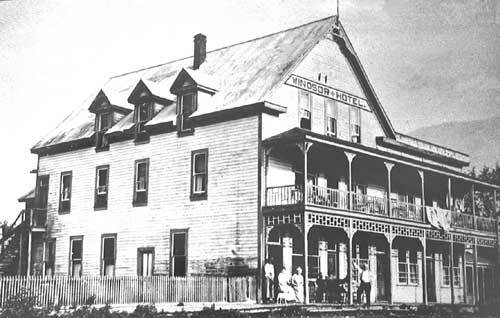 The Kootenay Mail newspaper of 31st July 1897 announced that McLennan and Black had chosen the site for the construction of a $5,000 hotel; in the fall of 1897, they had completed the Windsor. The Trout Lake Topic newspaper, which started printing on October 23rd 1897, stated in their first paper that first class lumber and plaster was used in the construction of the hotel and it was sumptuously furnished and elegantly designed throughout. It had hardwood floors, a large billiard hall, parlours and a reception room. The hotel, a three-storey frame building with dormer windows, was thought to be the finest in the Kootenay. The grand opening of the Windsor Hotel was held in October according to the Kootenay Mail newspaper, October 14, 1897. In 1907, when Donald McLennan decided it was time to sell the Windsor, Alice Jowett saw an opportunity to buy the best business in the town. On September 25th 1907 a deal was struck for the sum of $4500 to be paid in five payments over the next three years at an interest rate of eight percent per annum. Alice established herself as the most respected proprietor in the Lardeau. Her ability to present a first class establishment would place her as a legend for all time in Trout Lake. Alice became well known for her delicious meals and the fine china and linen tablecloths upon which she served her culinary delights. Edna Daney (nee Lindholm) went to work at the Windsor Hotel in 1930 instead of going to Halcyon Hot Springs because the pay was better at the Windsor. Some of the buildings were quite run down when she arrived. Edna and Alice got along well and she worked there for three years before marrying Alice’s grandson, Seldon Daney. Because of Edna’s long membership with our Society, we have been blessed with many archival items including the deed when Alice took over the Windsor Hotel in 1907. Edna also lived in Camborne and Ferguson so that her knowledge was generously given and used in our book ‘Circle of Silver’. This book is our most popular, almost sold out and won for author Milton Parent the Lieutenant Governor award for historical writing in 2001. In 1946, Alice Jowett at ninety-three years of age sold the Windsor to Jack Peters. It was a sad mistake. He sold everything of value and historical interest; this often happens with old buildings in many pioneer towns. The hotel has seen many changes since Alice had to give it up; some of the new owners have worked hard to upgrade and keep the Windsor in good repair. We wish the hotel and its new owners good luck in the years to come.